Day before yesterday me and Lara (my Bullet Thunderbird 325) decided to make the most of a rainfree day and chug down to the University. It was cloudy, cool and perfect driving weather. Chugging down NH4 - cool wind in my hair, warm smell of diesel dust wafting through the air ... I was almost unhorsed by the sudden appearance of an unholy pothole. It was small, sharp edged, deep and almost perfectly rounded. We bounced through it and I knew instantly that something was amiss. We rolled off the Vashi flyover and lo behold! there was a huge dent in the front rim. If I had been driving any other bike we would have come to a nasty stop at the pothole itself and as Vinodbhai, Bullet specialist at Kalina told me, if I had opted for magwheels the front rim would have snapped clean through. Truly they build these bikes to last. The tube was sound and after a wait of a few minutes when I saw that the air pressure was holding I decided to risk it and make a run for the Univ. We rumbled all the way. At the Kalina petrol pump I asked for a Bullet mechanic and was told to meet Vinodbhai in the adjacent lane. I did so. he turned out to be a very amiable middle aged fellow who took one look at the bike and said, "samajh gaya bhai kuch bolne ki zaroroorat nahin (I've understood it no need to say anything)". He then told me that I had two options - replace the rim or have it straightened out by an expert. I asked him if he would undertake to do it? He said he could but preferably I should go over to Usmanbhai at Bandra reclamation since all he (Vinod) would do was take the wheel over there anyways. He gave me directions and a cell number and I agreed to take Lara there after work. We slowly rumbled over at 6 pm and I found Usmanbhai in a tiny little shack off the main road at the foot of the fancy roundabout flyover at Bandra. To find Usmanbhai's you need to take the loop to SV Rd but at the end you take the arm that goes to reclamation and not the one that descends in front of Bandra masjid. Usman why was a jovial gent with salt and pepper hair and a matching stubble. He took one look at the rim and put me at ease by telling me not to worry, and that I was in safe hands. They (he and his man Friday) popped off the wheel in five minutes flat (not a mean feat considering this was the front wheel of a Bullet) and a few minutes later Usmanbhai was expertly removing the tube, tyre and the disk-brake disk. That he was a master was apparent from the first move he made. His skill at taking of the bolts on the disk whilst telling me not to worry (as there was a silca compound added whilst putting them on the first time and that this made things difficult but not impossible) while he was slowly loosening the bolts put me at ease. Here was a man who obviously knew what he was doing. He then took off all the spokes whilst giving me a running commentary on the 'good luck' that I wasn't running Lara on magwheels and that I obviously was an old timer at riding since I hadn't even taken the slightest fall after doing this kind of damage to the wheel. After taking a wooden mallet to the wheel rim to 'starighten it out he proceded to add the spokes. Usmanbhaithen placed the wheel on a special jig and proceeded to gently 'true' the wheel by adjusting the spokes (ie tightening them). He further informed me that all Bullets needed spoke tightening after the first 4 to 6 months and that I should get the rear wheel seen to later. I could see the rapt concentration as he heard and felt his way around the rim. It was slightly uncanny, he'd use sight, sound and feel to check repeatedly on the rim. After almost half an hour and a few gentle taps to get rid of the last bumps on the rim he spun the tyre in the jig and lo it spun with no wobble whatsoever! I was truly impressed. We got to talking and he told me that this was his forte and that he had been doing this all his life. He reminisced about the early days in Bandra when Parsis and Christains brought their cycles to him esp the ones with gears and brakes in the rear drum and that there was no one else for miles who knew how to 'trough' a cyle wheel like that, Usmanbhai went on to work art the Rajdoot factory and there he was in charge of wheel assembly, he then decided to go it on his own and came back to Bandra and set up shop. Today he is the No. 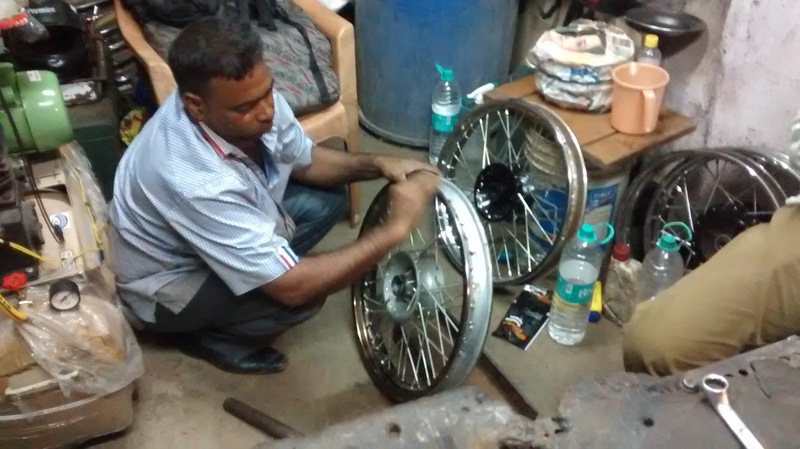 1 man for Bullet rims, spokes, drums and he also extends his expertise to other bikes. He fondly told me that he was the man in Mumbai for double spoking and for straigtening out rims for Bullets. Double spoking is doubling the number of spokes on the wheel with thinner spokes, the drum needs to have new holes expertly drilled and then it needs to be re-spoked. Usmanbhai not only does the spoke fitting but also drills his own holes, no mean feat considering the precision required. He very quietly said that all the Bullet ustaads (experts) and mechanics of Mumbai know him and if they want quality work they come only to him. I was so happy to have been a part of his world even if it was for a couple of hours. To see a man of his skill and experience, doing something that in any other country would have been done by a bevy of machines or most probably where the damaged part would simply have been replaced without a thought. It is people like Usmanbhai who keep alive the traditional karigiri something so essential in lifting a craft to an art. I salute these men and women who toil on doing their thing with expertise and quiet dignity. Lara and I drove of from Usmanbhai's with no wobble at all and a smile on our faces. For a moment, I felt like I am living in Mumbai right now! :) So, beautifully you've written Kurush!